It seems hard to believe now that just over a year ago we were between fosters when we took on a puppy that had been rescued by Cork Dawg in southern Ireland. A couple of days later she was brought over with her fellow rescues and we picked her up that same evening. When we first met her, she had just had a bath to help sort out her terrible Mange. We could not believe how small she was and how she had managed to survive her ordeal. 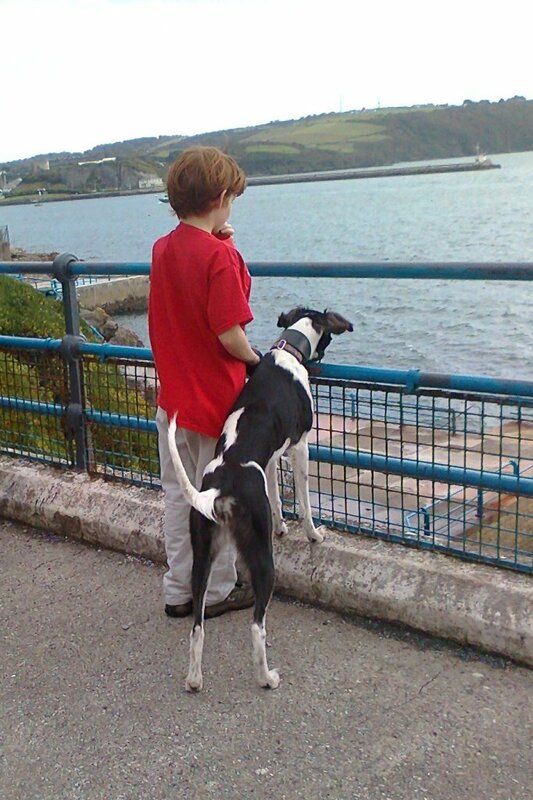 We took her home and introduced her to the rest of the pack, two Greys, Trickie and Amber and our Lurcher Megan. Our youngest son christened her Sophie and instantly they were inseparable. By the next morning we asked if we could adopt her. Over the following weeks her coat grew back, she came out of her shell and was taught how to be a loony puppy by Megan and how to chill by the Greys. Within a couple of months she grew into a beautiful long legged Saluki. She loves running on the beach and is now almost as fast as our middle aged Greys much to their disgust. Over the summer she went camping in the Isle Of Wight and Devon which she loved.